The two versions of the official NZ temperature data — the NIWA graph in the foreground has been “adjusted” but NIWA doesn’t know how; the graph behind it shows raw NIWA temperatures since 1850; there’s no warming. Both graphs use official NIWA data, but NIWA don’t know what changes created the warming and, until they produce a replacement, there’s no scientific reason to accept that version. See larger versions of the raw and adjusted temperatures. Regular readers will know that we asked NIWA how they adjusted the NZ temperature series. In reply, they distracted, deceived and disparaged us. We checked what they told us and it was false. They lose. They admit they never had the temperature adjustments we were asking for. Why didn’t they just say so in the beginning? We and the NZ public await an apology for their dissembling. They’ve done the hard thing and admitted the truth. So the good news is they can now get on with some real science. They say they will “recreate” the adjustments. Whatever they mean by that, it must be an improvement on trying to denigrate us when we ask for information. It is also good that they reexamine the 30-year-old claims of warming that wobble now they lack any scientific support. In fact, there is evidence they are false. More on that later. The Climate Conversation Group (CCG) and the NZ Climate Science Coalition (CSC) combined to investigate the New Zealand temperature record. We started with the official graph and the raw temperature readings, both published on NIWA’s web site. There are big differences between them, as you can see in the little graphs above, but there’s no explanation for those differences on the web site; they don’t even mention them. Our paper, Are we feeling warmer yet? published on 25 November, 2009, describes the facts and figures. The scientific term for adjustments to raw data is the Schedule of Adjustments (SOA). It’s quite normal to have an SOA, there are many accepted reasons to adjust a series of temperature readings that span a period of time (a time series) and it’s acceptable to do so as long as you follow a scientific process. Since we asked for the adjustments, NIWA have told us all about them. They said that everyone knows you have to make adjustments for things like station moves, where the altitude changes. They talked about how to make the adjustments, referring us to numerous papers which describe different methodologies for doing so. They told us where to find the adjustments, citing obscure papers from 20 and 30 years ago. Bizarrely, they alleged that we already “know” or “have” the adjustments and claimed that a couple of emails they had sent contained the adjustments. They did everything they possibly could to help us, except hand over the adjustments. It has turned out that they truly did all they could; there was actually nothing more they could have done, except to recreate the adjustments… now, there’s an idea. Anyway, we duly followed their references. We looked very carefully, as we really wanted the adjustments. We found that the two emails they quoted were not sent by NIWA, and they weren’t sent to the NZCSC. They came from Dr Jim Salinger, who sent them to two independent scientists (who happened to join the Coalition about then) right at the time (July 2006) when the Coalition was created, before it had considered the New Zealand temperature record. So NIWA made it sound as though these two private emails were proof that they had disclosed the adjustments. But it was poppycock. So they didn’t come from NIWA, weren’t sent to the NZCSC and didn’t contain the promised adjustments — there couldn’t be much more wrong with them. Our scientists searched through the other scientific papers that NIWA cited in their impressive-sounding press releases. None of them contained the actual adjustments. NIWA have many supporters throughout the country. They heard what NIWA said to us and noticed the citations we were given. They thought the answers that NIWA had given us were good. We did, too, at first, before we checked them. When we complained and repeated our request for the adjustments, their supporters screamed loudly. They couldn’t understand why we didn’t believe NIWA. We were being unfair on them, they said. We already had the adjustments, we were just creating a nuisance. We weren’t proper scientists, they said, and we should stop interfering with NIWA’s proper duties. They added gratuitous insults and aimed personal invective at members of the Coalition. Everyone was upset. The most senior scientists in the CSC, including Dr Vincent Gray and Dr Warwick Hughes, had first asked for the SOA in the early 1980s. Dr Jim Salinger was the scientist they asked, since it was he who worked on the time series and adjusted the data. Vincent and Warwick wondered how he had done the work and asked to have a look. Salinger said you can’t have the data. For 30 years he said no. Then, about a year ago, he was fired from NIWA. Now perhaps they would not be denied. But there was no longer anyone at NIWA who knew how the Salinger adjustments had been made and it would be embarrassing to admit they didn’t even have them. In their press releases, NIWA said: For more than two years, New Zealand Climate Science Coalition members have known of “the need to adjust” the “seven station” data. The “methodology” for adjusting for site changes in the NZ temperature record was published in the peer-reviewed International Journal of Climatology in 1993. Dr Salinger’s “adjusted temperature series” for each of the seven stations was provided to NZ Climate Science Coalition member Warwick Hughes on 19 July 2006. “Information about changes” to the seven station sites is documented in a publicly-available report. NIWA posted the “adjusted temperature series” on-line. On and on it went, but none of these statements told us the actual adjustments or where to find them. Of course, they wished to obscure the simple fact that they couldn’t say anything about the actual adjustments, because they didn’t know what they were. There was no SOA. It was Salinger’s secret. It says other things, too, but that is the most important. To be frank, the main objective of the study was to obtain the SOA. It was not to show that the raw data has been tampered with, even though that opinion was emphasised and is still a possibility. Our objective was achieved upon Tim Mahood’s admission on 29 January that “NIWA does not hold copies of the original worksheets.” Our study is therefore a success, because the scientists who made proper requests for the data and adjustments that will let them replicate Jim Salinger’s work now, for the first time, have a proper answer. The answer, of course, is that “we don’t have them”, and that will lead to further questions or whatever. But at least the answer is truthful (well, we assume it is!) and is much to be preferred to the unexplained “No” which our independent scientists have endured for thirty years. It must be frustrating for NIWA’s scientists to have valid criticisms of what seems like a poor-quality “paper” which achieved wide publicity for our questions. It doesn’t seem right. What is actually happening is that a situation of great wrongness is being corrected. NIWA are facing up to their sustained intransigence and we will obtain access to public data for normal peer review. The actual temperature record will now be (is actually now being) subjected to a more rigorous independent examination than ever before and this can only be a good thing. Activists around the world are wanting to extract amazing amounts of money from the pockets of the public on the basis of these temperature records. It must be well justified. How much knowledge is enough? Perhaps only when every schoolboy can recite details of temperatures for the past 150 years will the nation know enough about them. Why did they never question the graph? NIWA are exposed — no matter what analysis they come up with, they have been forced to admit they never had the adjustments, even though they tried to smear us by claiming they had given them to us already. Hot Topic of course picked up on this and made a big deal of it, and many people believed them. We can surely work with NIWA, but they should issue a statement of regret that they deceived us. They must also explain why they never questioned the graph, since it was based on a 30-year-old thesis and non-peer-reviewed work. At the very least, they are guilty of confirmation bias, in that they blindly accepted the results because it suited their beliefs. They should also explain to the ministers (Mapp, Hide and Smith) why they presented unverified data to support the ETS legislation, and why they attacked the NZCSC when they raised the issue, instead of admitting they didn’t have the SOA. It made them look like activists instead of scientists. All at NIWA now understand what we mean by a SOA and they admit that the original SOA is missing. That alone should take a severe toll on NIWA’s credibility. It might be said that the joint CCG-NZCSC project team have won their campaign. They have shone a light on the murky practices within NIWA, and the probable long-term outcome will be a respectable NZ temperature record. But the NIWA credibility issue is even more important. They obviously knew they had no records, but didn’t tell the MPs in Nick Smith’s office meeting, they deliberately fudged replies to Rodney Hide’s questions, stated on their website that the data had been given to NZCSC in 2006, manufactured a (wrongly) unadjusted 11-station graph as a red herring and quoted passing ships as another red herring. Throughout, they acted as advocates and not as scientists. Given the importance of New Zealand’s temperature record, both nationally and internationally, and the fact that Jim Salinger’s “new” record was markedly different from the previous record, any responsible and well-managed research organisation would have made sure that the adjustments were properly documented, that they were independently reviewed and the adjustments and results of the review were archived. This did not happen. We conclude that NIWA’s internal processes do not follow basic principles of good record-keeping and rigorous quality control. There is one more question mark over NIWA’s actions and events of the last week. It has to do with Dr David Wratt. Last year, he was prominent in presenting falsehoods in their press releases and expostulating against me and our study. He stood by while Nick Smith shamefully excluded Dr Vincent Gray from the meeting in Nick’s office, railed against the NZCSC during his presentation to the MPs there, strenuously avoided giving Rodney Hide what he was asking for and finally publicly undertook to “post it all up on our web site” though he has neither fulfilled his promise nor offered a progress report. This year, he is strangely quiet and has let the company lawyer speak for him. Of all the personnel at NIWA who owe us an apology, Dr Wratt owes it the most, since he is in charge, he was the leader in the media campaign against us and it was his voice we heard on the radio and in print. We will give his apology our whole attention. What happens next? We await the new Schedule of Adjustments that NIWA are working on with great interest. When it appears, we will examine it. We remind NIWA there are deficiencies in surface temperature records around the world so it behoves them to demonstrate beyond doubt that their methods have produced an impeccable result. Somehow they must show adherence to rigorous quality control and they must without fail give proper scientific validation for each decision. In many ways, NIWA are the public face of science in New Zealand. Few Crown Research Institutes enjoy such prominent exposure on varied fronts as NIWA does. So it is the more distressing that they have betrayed their own high standards in this long scandal regarding the national temperature record. Let us hope they apologise for their shabby treatment of us and assure the nation they will repair the damage and strive to rise again to the preeminent position they once deserved. They have made mistakes, but still they are part of this country, part of our family. They have only to demonstrate their re-commitment to excellence to secure our whole-hearted support. 1. The SOA was requested under the Official Information Act, and couldn’t be produced. Although the response said the original worksheets were lost, it made no similar claim for any current SOA. Clearly, no formal documentary record of the adjustments has ever existed. NIWA has not observed even the most basic responsibilities of a Government agency charged with the custody of an important national archive. How can an SOA be re-created when it was never created in the first place? 2. Nobody knows the scientific yardsticks and/or subjective reasoning that lie behind the current official temperature record, except Jim Salinger. He is no longer a public servant, and his dismissal caused a long and bitter dispute with NIWA in the courts. He presumably kept no written record of his NIWA doings, as such a document would belong to NIWA at law. How, then, can Jim Renwick and his staff replicate the methods, the subjective reasoning, the error bars and the judgements applied by Salinger over a 30-year period? Perhaps “re-create” is apt because so much creativity will be required. 3. NIWA have been working on the New Zealand SOA since November (when Salinger’s appeal against dismissal was rejected) and it is still not completed. After it is finally disclosed, later this month, a scientific paper describing the SOA will be published – allowing scientists all over the world to attempt replication and critique the reasoning. Why would Dr Renwick & co simply re-create Salinger’s adjustments – which have never been peer-reviewed or validated in any way (or even recorded for that matter)? Why not start from a zero base and try for an SOA that is respectable and accurate? That’s what real scientists would do. None of this comes as a surprise to me. A few years ago, when I was head of mathematics at Northland College in Kaikohe, I emailed Jim Salinger and David Wratt at NIWA, explaining that my Year 13 Statistics students wanted to obtain a copy of the relevant temperature records for Northland so that they could determine for themselves whether or not “global warming”, as opposed to “man-made global warming” was indeed happening in Northland. Surprise, surprise, despite repeated requests, I didn’t get a single reply, and now we know why. As I have said for years, man-made “global warming” is merely ‘creative reporting by arrogant people’ and one doesn’t need to be highly intelligent to figure out what the acronym for that is. Intelligent use of the Internet is the people’s best defence against those who would subject us to totalitarianism. How do we highlight these examples of incompetence? You’ve just highlighted this one! Feel free to give all the details you can remember. Our science team want to have a look at the GIStemp records. I don’t know when they’ll have time for it, but stories like this give them encouragement. Thanks, Neil. how do I send you copies? That’s great. Perhaps we can put them into a special posting. Click “Contact” at the very top of this page to open your email client and attach the copies of your emails. You raise a curious,point, Peter, because I was under the impression that all the raw temperature data was available on the NIWA site, in the CliFlo database. Are you saying Northland figures aren’t there? I wasn’t aware of that at the time, so didn’t look. A simple response from either of the two scientists would have got us started. Ah, yes! And, had either of them given a polite reply, you would no doubt have become a valuable NIWA supporter. Not to mention a class full of young adults. Their loss! Thanks. Seems to be a pattern here with NIWA, IPCC, BOM, Metservice etc. So if they cant show the raw data because it proves them terribly wrong what are they going to construct the new data from? It’s a concern. We’re talking about the most basic metric for deciding whether the earth is warming and there seem to be unhealthy activities occurring around the measurement of that metric. Where will the “new” data come from? Quite a few people would like to know. There’s a lively debate about it in several places. The basic idea is to adjust the raw readings to account for environmental changes to the station, like a move, or the growth of nearby trees, the erection of buildings, laying down of paved areas, and so on. How is that done? There seems a variety of answers, all of them some combination of “compare with nearby sites” and “guess”. But there’s another serious question: If you take the temperature now, here, and an hour later, nearby, what’s the temperature? (Say we have two or more stations in one city.) If you take the temperature in two places simultaneously, what’s the temperature in that area? Is there any such thing as an average temperature for a region or a period of time? I suspect that soon we must face a new approach concerning atmospheric temperatures. A new paradigm. It’s fascinating. Go, Kiwis, go !! Science needs to publish their methodologies. Anything else is unacceptable. I thought JWD Hessell had sorted out the problems with Salingers assertions back in 1980. I thought he showed pretty convincingly that we had a heat island and sheltering effect. I’d also make the point that NZ has a slightly peculiar problem with shelter.. our trees grow so fast! P radiata grows up to 2 metres per year, and our research indicates that the shelter effect from say, a windbreak, is up to 20 times the height of the trees. That means some of our weather stations 500-1000 meters away from a windbreak could receive some effect. Incidentally, I’m pretty sure that part of our rural records came from the NZ Forest Service, and where the screens were situated might have open paddocks when established, that changed as buildings were erected and car parks were established. So from after the war to the late 80s many weather stations would have been affected by shelter and heat effects. Peter – how on earth could anyone, let alone statistics students “determine for themselves whether or not “global warming”, as opposed to “man-made global warming” was indeed happening in Northland.” from “temperature records for Northland”? I am not surprised NIWA ignored you as such a request would seem to hide an agenda if presented in those terms. Craig – methodlogies were published – a long time ago. See Rhoades 1, M. J. Salinger “Adjustment of temperature and rainfall records for site changes” International Journal of Climatology Volume 13 Issue 8, Pages 899 – 913. Did NIWA publish the standard errors of the site change effects? No. Did they even mention site change adjustments? No. Did they treat the data as ‘clean’ by publishing the graph for the world to see without any qualifiers? Yes. Yet they have done just that – they have selected 7 essentially isolated sites, all in urban centres, and in none of the adjustments is there any evidence of reductions in recent temperatures to account for urbanization effects. See Hessell (1980) for an idea of these effects. Note that Hessell deals specifically with some of these stations (Eg: Albert Park). The very fact that you are willing to discuss this surely gives a lie to the coalition’s claim that NIWA had no justification for the adjustments – or to their claim in their discredited report that there was no justification for adjustments – that there were no site effects! Even Vincent Gray has acknowledged that is mistaken and that he should have picked it up when he vetted the report. Ken, please pay attention. I said it was simple. I said you were overlooking the point because it was simple. You are still doing it, or you are being pig-headed. We do not allege data tampering. We wish to confirm the scientific basis for all the adjustments NIWA have made. NIWA give no justification, on their web site or anywhere else, for the adjustments they have made to the official NZ temperature record on their web site — the famous “seven-station” dataset. They say there is a schedule of adjustments, they have even cited references, but they turn out to be false. So, we have original data, in the CliFLO dataset, and we have substantial adjustments. The only thing that distinguishes properly justified, scientific adjustments from data tampering is the existence of a schedule of adjustments, with each adjustment stated and justified. Our question to NIWA is: Where is it? You are not helping the scientific investigation here, Ken. If you know where the SOA is, tell us. Otherwise, please tell them to tell us. One other point: you hold our paper to high scientific standards — higher than it aspires to, since it’s a very simple paper. But you appear to hold NIWA to no standards at all. Do you approve of their refusal over 30 years to disclose the SOA? Do you approve of their misleading citations (one should properly call them deceitful)? Do you approve of them citing emails that did not contain what they claimed? Do you approve of them publishing a graph (of any kind) of national statistics that lacks proper scientific credibility? It would be considered rubbish in a third form science class! Take your time, but let me know. Richard – you claim “They say there is a schedule of adjustments.” Please provide me with a link to NIWA’s use of the term “schedule of adjustments” on the website? Well, no, they haven’t used that term in public yet, although James Renwick is happy to use it in personal communications with me. Please read the comment I made under the other post, where I state that we don’t care what it’s called, we’re just talking about the adjustments and we’re relaxed about the term we use. You’ve chosen to pick a nit in the comment I made. I’d be interested to hear your response to my other, more substantial questions. For example, do you approve of their refusal to disclose the SOA? I’d like you to remember that when they cited those papers where, they said, we would find Salinger’s adjustments, not one of them was correct. They were all about the methodology. Do you approve of that? Do you think they didn’t know the adjustments were not there, or that they did know? If your child asked for a pie, would you refer him to several recipes? OK Richard, you admit there is mo such thing as a scedule of adjustments. As I thought. It was just a way of confusing the issue. So much for your claim that it was a scientific concept or term. You are, of course, in a bind. As you continue to claim that no adjustments are required, a point made in your report with your unjustified assertion that there were Bo significant site effects, it does make rather a joke if your harping on wishing to see all the seals of paper. If you want to justify your claim produce the approprare statistical abslysis. We know you can’t because the fact of site effects is very obvious. If you do accept the need for adjustments then admit your mistake, and apologise for your allegations. If you really want to validate the actual adjustments used then deterimine them from the data. If your estimates ate different to NIWA’s then there is something to talk about. But you have a hell of a way to go as you have not yet withdrawn your claim that there were no sites effects to worry about! Thanks, Neil. I’ve replied to you offline and I look forward to seeing the emails. Ken is being intellectually dishonest. Call it “schedule of adjustments” or call it “alexander.” Whatever the name, its contents should show the amount of the adjustments made, how the amount was calculated, and the basis for the calculation. Richard has never suggested that there is no need of adjustments. Everything he writes states the opposite: adjustments are necessary. Just tell us how you made them! All he is asking is for the documentation of the amount of the adjustments, how they were calculated and why. It’s very simple. Science requires reproducibility. Without the SOA the final temperature series is not reproducible. Ergo, this is not science. Mark – Richard has definitely claimed there is no need for adjustments. That is the fundamental mistake. His report included the statement: “the station histories are unremarkable. There are no reasons for any large corrections.” He claimed in another discussion here “Yes, Hot Topic were correct in stating we said there were no reasons for large adjustments.” He reproduces the discredited graph at the top of this post. Coalition press releases have promoted the idea that scientists should remove adjustments and instead go with the unadjusted data. If Richard and his mates were intellectually honest they would listen to Vincent Gray’s admission of this mistake, withdraw their report and apologise for the slandering of NZ scientists in the report and subsequent press releases. They should follow that with an admission that site effects are obvious and adjustments necessary. Only then would they be in an honest position to discuss details of adjustments. I strongly believe that if I were to delve into the details and debate with other scientists on this matter we could come up with a range of approaches to adjustments in most cases. We would probably agree that probably no method was any more correct than another (ruling out the obvious silly ones like no adjustment required). I also strongly believe from experience in similar issues that we would find, given the inherent variability of the data, most procedures would give very similar results. In other words, the specific methodology is of little significance. Unless there are strong basic physical parameters that can be used to give a theoretically “correct” methodology. Now, I think it could be worth demonstrating this point. the simplest way would be for someone to use the publicly available data (the data that NIWA originally used) to determine methodologies that they believe are best. Do the calculations, Compare the resulting adjusting data with NIWA’s data. 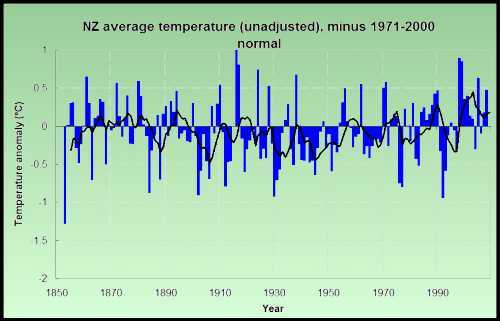 And determine from this a likely change of temperature in NZ in the 20th Century. (Frankly, I would do this if I had the time. I may well do it later just to prove my point). As I said, I strongly believe that despite the independent selection of methodology (provided it is done honestly) and the fact that the methodologies may well be different, that the final conclusions will be the same within reasonable estimations of variability. Of course the question of motive comes into this. This procedure would be perfectly natural for anyone interested in arriving at the truth, or who honestly thought a mistake had been made. I have always done this when confronted with these sort of issues (rather than sit back and whine). And you know what – there’s nothing like actual facts, actual evidence, to convince colleagues in such matters. I don’t believe the coalition is honest here. they are being political not scientific. They are not interested in truth, just in discrediting our scientists. If they were honest they would do their own simple calculations. But really, do they have even the expertise to do such simple calculations. They didn’t even analyse for site effects and yet claimed there were none! Richard told me there was no scientific input into their paper! he later told me that there scientists wish to remain anonymous! he is all over the place and his mate Vincent admits it was a mistake! Most people get what was said in the paper. The Coalition has had much international comment, from many experienced and intelligent people. Most of it has been thoughtful and well-considered. We have had suggestions, comments and analyses from people who have downloaded the data for themselves and examined the issues directly. Even a NOAA scientist has commented favourably. Most people agree with the study’s findings – the effects of the Salinger adjustments are as described, and the rationale for the adjustments is unclear according to the station histories published in CliFlo. The fact that the overall trend that NIWA advertises is made up mainly of adjustments surprises many. Most people agree that the adjustments should have been mentioned. Most agree that they would expect that any adjustments should be minimized, but should also cancel out in general. To find such a strong reduction of older temperatures in 6 out of 7 cases is a reasonable basis for further investigation. It’s the magnitude of the adjustments that surprises most people, not that they are there. Small adjustments here and there, that tend to cancel out in the main would raise no eyebrows. Scientists are generally sceptical and curious, and so they should be. When something doesn’t add up they want to know why. They also point out that nowhere does NIWA mention that the stations had to be combined from various locales in order to produce a long-running history. For example, “Wellington” is made up of Knowles Observatory, Buckle Street, Thorndon, and Kelburn. There is no overlap between any of these. NIWA used Thorndon/Kelburn/Aero as an example of a necessary and reasonable adjustment, but equally, many experienced folk have called even this into question, asking whether assumptions about two stations based purely on altitude, and separated by many years, are valid. There are many cases where altitude effects are reversed from the expected change. We have pointed out two of them in the NZ series alone: Hokitika and Auckland. Yet the impression NIWA gives on their graph is that these 7 urban stations were chosen because they were long-running and reliable. Nothing could be further from the truth (see Hessell 1980 – Jim Hessell performed a long and detailed analysis of the main NZ stations, and compared the urban and rural histories, coming to the conclusion that there has been no significant warming over NZ). He concluded that the urban records were subject to various problems and shouldn’t be used if possible. Salinger himself said a similar thing in Rhoades & Salinger 1993, as I’ve already pointed out. Salinger also said that wherever homogenized series were used, the standard errors must be published and explained. A final point: the purpose of the paper was not to compare the adjustments of person X against the adjustments of person Y. It was to examine and quantify the effect of each of the adjustments made by NIWA (Salinger) on the UNADJUSTED data, especially since NIWA had not publicized the existence of any adjustments in any of the publications that used the graph, and also because the trend produced by the graph is questioned in the peer-reviewed literature of the time, and is in contrast with the head of NIWA’s own stated position that NZ should warm less than the rest of the world, due to the effects of the ocean. Had the adjustments been minor, and had they not materially affected the overall trend, there probably would have been no interest in the result. As it is, there has been considerable interest, hence the call for NIWA to produce the reasons for, and magnitudes of, each of the adjustments. This is entirely reasonable, in my view. Bob – that is disingenuous. Richards paper was circulated overseas by the local conspiracy theorist Ian Wishart. It lead to numerous conservative and denier blogs and newspaper headlining it. Along the lines of NIWA using dishonest adjustments, the raw data stand alone, all the warming is introduced by adjustment. warming is mann made, NIWA scientists are crooks, etc. etc. You know the sort of hysteria that climate gate has generated. Before the coalition or Richard can claim any credibility or moral stance here they have to correct this impression. No-one in their right mind will take them seriously if they don’t. Surely it’s obvious that there can be no discussion of real details while that slander hangs in the air and Richard persist with the silly assertion that there were no significant site effects. First of all: Greetings from Germany, where we enjoy a nice cold winter. I am just an interested citizen and have been following the debate about “Man made Global Warming” for a while now. Among the many things that could be said, I´d like to point out two: First, there is an unhealthy mixing of scientific dissens and personal feelings. Second, the extent to which many claims in the issue are based on extremely doubtful sources (temperature records; CO2 assumptions and models that have never been tested; …) is bewildering. Concerning temperatures: How useful are average temperatures at all? To me it would seem to make more sense to observe maximum and minimum temperatures. It is for example possible to imagine a warming trend in average temps while the max. temps fall and min temps rise(i.e. get warmer). This would imply a reduction of daily temperature differences and that in turn would certainly have other effects on weather & climate than a rise of avg. temps resulting from rising max. and falling min. temps. Going by averages means that all theses informations are lost. A last note: The discussion here is an nice deviation from discusions in almost all other sites I came across. That is the reason why I post my first comment on “Man made Global Warming” here. New Zealand is a great place, and I believe that Kiwis are able to do things not just different but better. Thanks for your comment, Thomas, and I hope it’ll warm up for you soon. I’ve always enjoyed Germany when I’ve travelled through there, it’s a wonderful country. You raise a very interesting point about average temperatures. Dr Vincent Grey, one of our members, makes this observation often. One should really plot all three curves in these discussions – min, max and mean. In Jim Hessell’s paper for example he discusses urbanization effects and their impacts on both minima and maxima over time due to sheltering effects etc. An understanding of why the mean is increasing or decreasing is vital. Simply looking at an increasing mean and declaring that “New Zealand is warming up due to greenhouse gas emissions” is somewhat naive. There are many factors contributing to surface station measurements in urban environments, and generally they all tend to increase the trends. If someone was trying to remove these urbanization effects, one would expect most earlier values to be increased, not decreased. Regarding New Zealand, yes it’s a wonderful country, and we know we’re very lucky to live here. The beaches and forests are superb, and the people in general are friendly and polite. I hope you’ll get a chance to visit one day, if you haven’t been here already. One of the interesting things about any organisation – professional group, leisure group, country, etc – is that the acceptance of that group and the standing of that group (as seen by everyone else) is largely controlled by how open that group is. The Masons and the Communists were (are?) secretive about their activities. The Masons are probably harmless, where as the communists we now know were utterly destructive. Now that most communist countries are pretty much open, we can see that they were simply mistaken idiots and that they werent hellbent on blowing the world to smithereens – they neither had the means or the brains to do so!. However while they remained secretive – we were all sure that they were the devil on earth. While places like the CRU unit at the East Anglia Polytech and NIWA behave in a manner similar to the Masons or the communists dictatorships – they will continue to be utterly mistrusted, and there will continue to be efforts to find out what they are up to – especially in light of the fact that the information they have previously put out has resulted in a programme that is going to cost every citizen lots of money in the form of a carbon tax (or similar). A very good point above about average and mean. My maths teacher wife keeps telling me that an ‘average’ is quite misleading – the only true method is to ‘Mean’. However – noting the margin of error and accuracy of some of the North American temperature stations – Im starting to think that we are no where near even thinking about average or mean – it seems they could be so far out as to be utterly meaningless. If the same is the case in NZ, then anything NIWA puts out is simply rubbish. There is no doubt that some of the science and/or management around climate change has been pretty shonky – sort of similar to the management around finance companies! If it wasnt for the internet we would all be pretty much in the dark. The emails from CRU wouldnt exist and various governments would be rushing headlong into various programmes to tax their populations into subsistence . Thank god that has been bought to a halt while some serious science is undertaken. I see today another investigation into the CRU is announced – although its very much about the methods used at the CRU – not the conclusions. I think anyone who expects the investigation to come out negative is involved in wishful thinking. I cant see – in the UK – one group of climate scientist concluding that another group are a bunch of bums. I’d like to say that I, too, helped the overseas distribution; it wasn’t just Wishart. Why give him all the credit? How very good to hear from you, Thomas. I’m pleased you chose the Climate Conversation as your starting point; an excellent choice. It is strange that discussions of atmospheric temperature have centred on averages. These discussions here, once they get past the obstructions we’ve experienced from NIWA and can discuss something like an accurate temperature record, will, I’m convinced, soon turn to the very question you raise. For there are important considerations in taking temperatures that don’t arise with other metrics. Does a Global Temperature Exist? Christopher Essex, Ross McKitrick, Bjarne Andresen, 2007, J. Non-Equilib. Thermodyn. 2007  Vol. 32  pp. 1–27. Physical, mathematical, and observational grounds are employed to show that there is no physically meaningful global temperature for the Earth in the context of the issue of global warming. While it is always possible to construct statistics for any given set of local temperature data, an infinite range of such statistics is mathematically permissible if physical principles provide no explicit basis for choosing among them. Distinct and equally valid statistical rules can and do show opposite trends when applied to the results of computations from physical models and real data in the atmosphere. A given temperature field can be interpreted as both ‘‘warming’’ and ‘‘cooling’’ simultaneously, making the concept of warming in the context of the issue of global warming physically ill-posed. If you are interested, I have a pdf. It’s a fascinating topic and vital, I think, in these crazy times, when fractions of a degree over years drive people mad with anxiety. It’s very kind of you to express such confidence in us Kiwis. You make good points about secrecy. Do you have a reference to the story about the new CRU inquiry? So you want to share the blame. Good on you. Best not to hide these things. I guess the scientific community is certainly recognising the need to be more open and to avoid a siege mentality (although, let’s face it – some of the attacks are pretty shocking). The handling of FIO requests (a relatively new requirement) is obviously the key question in the investigations. But perhaps this coalition could also take that lesson on board. Why should the “science team” behind this discredited report and graph desire anonymity? Why can’t they face up and discuss the problems with the report and graph? Why should they insist on using Richard as a conduit? All that is highly unusual. Our report and graphs remain unchallenged. Nobody has discredited them. They make a simple comparison and do it convincingly. What’s wrong with anonymity? Deal with the facts that emerge. Deal with NIWA’s disgraceful behaviour. Richard – it was in “The Times on line” this morning. Its not there now (some 10 hours later) and i dont know enough about searching old pages from places like newspapers. It was an enquiry into the systems used at the CRU. It wasnt anything about the emails nor about any conclusions the CRU had reached. “……………….The University of East Anglia announced yesterday a second inquiry that would investigate the validity of the CRU’s reports, which present evidence that man-made emissions are causing global warming. The decision to hold a second inquiry is an admission that Sir Muir’s investigation will not be sufficient to restore trust in claims that the world is at grave risk from rising temperatures. The university is one of Britain’s leading research centres on climate change and helps to compile the global temperature record published by the Met Office. This record is used by the Government to justify its targets for heavy cuts in carbon emissions. The Royal Society, a fellowship of leading scientists, has agreed to help the university to choose the team that will conduct the new inquiry. However, the university itself will have the final decision on who is selected. It pledged that the members would have “the requisite expertise, standing and independence”. ………………. Mmmmm . they select their own investigators……………… doesnt sound right..
Its interesting that the big conference was held in Copenhagen…………As the bard himself said – “theres something rotten in the state of Denmark”. Maybe holding the IPCC conference was one of the worlds great Freudian slips maybe. Barry – the Copenahgen conference was not an IPCC conference. That’s not the IPCC’s role. Thanks, Barry. This could be significant. I agree they shouldn’t be picking the inquiry team. The IPCC says its reports are policy relevant, but not policy prescriptive. Perhaps unknown to many people, the process is started and finished not by scientists but by political officials, who steer the way the information is presented in so-called summary for policymakers [SPM] chapters. Is that right, the Guardian asked? How is some sort of weird journalism relevant to the Copenhagen Conference. it was clearly not an IPCC conference. That is definitely not the role of the IPCC. If you’re taking a national average using separate stations what is the point in homogenising local subregions first, e.g. for a site relocation? Or, if you’re trying to determine global trends by measuring winds off the ocean wouldn’t it be better to always measure on the windward coast? How do you decide what makes any one location or regional sub-grouping any more or less relevant in determining a national or a global trend? If it was to determine the temperature of a particular region, e.g. Wellington, then using NIWA’s homogenisation formula would be appropriate. But, that’s the only time. This business of gridding land areas and giving equal weight to equal area regardless of the number of thermometers actually present there seems dubious at best. So ripe for errors or manipulation. Local variations are unpredictable and change with time. For example Hokitika South is 0.3C cooler than Hokitika Airport despite being at less elevation. And if you’re going to talk about making adjustments at individual stations, wouldn’t the urban heat island effect tend to increase temperature with time? The raw figures show a flat trend nationally. Therefore, if the UHI effect is in existence it is masking a cooling trend.